‘Tis the season to be merry and jolly. ‘Tis a season of giving and receiving and eating an abundance of ginger cookies and drinking an unnatural amount of eggnogs with or without spirits (wink-wink). ‘Tis the season of many many holiday parties, be it thrown by coworkers, at work, by family members or friends. Fun times! But it can also be overwhelming trying to attend all those parties while trying not to offend your hosts. It could be also be overwhelming when you are in charge of your company’s holiday party or throwing one in your home. We’re here to help. What kind of party are you throwing? A dinner party? A cocktail party? A potluck? What’s the theme? Do you have your christmas tree, poinsettias, garlands, mistletoe, wreath for your door, hanging stockings for your Christmas parties? Or your menorah, dreidel, and the Star of David for your Hanukkah party? Whatever you’re celebrating make sure you set the atmosphere first. People will enjoy a party that “happening” not snoozing. If you are planning a dinner party then have some soft holiday music in the background. Make sure that your table setting reflects the joy of the season. Centerpieces with winter evergreens and beautiful flowers and candles, pinecones and ornaments. You can use ornamental balls as place settings by writing your guest’s names on them and setting them on the plates. The possibilities are endless. If you are throwing a cocktail party make sure that every room the guests will be in, oozes the festive season. Distribute small flower arrangement with holiday colors throughout the house make sure the trimmings and ornaments and overall theme of the party is well distributed in all the areas of your home when you know guests will be in, even the powder room. Have some upbeat yet appropriate music (depending on who your quests are). This season is a reasons to have fun with and celebrate your coworkers. It’s the season for evergreen wreaths on your walls and doors, poinsettias in every hallway, conference room and receptionist desks, garlands on your windows and railings, cinnamon-ey and ginger-ey baked goods in your kitchens, personalized holiday decor in each employees cubicle to celebrate their holiday. Workplace holiday parties shouldn’t feel like an obligation to the employees, it should be something they look forward to and enjoy while they network if they choose to. The season calls for some warmth, goodwill, peace, hope, joy, harmony and prosperity. All great things to wish mankind and great qualities to have in a workplace. Let your party reflect that. Whether your party is a formal one in a banquet hall with catered 5 course meal, live entertainment, and bottomless flow of wine and champagne and elaborate centerpieces gracing each guest table or a conference room turned party room with that cool guy from the cubicle at the end DJing and home baked cookies and pies or anything in between, it should reflect the joy of the season. It only takes small small special touches to achieve. Bottomline don’t let the stress and the hustle and bustle of the season steal the joy from it. Enjoy yourself whether you are attending the party or throwing it. And find a great florist to help your shoulder some of the stress of the preparation. Last week we talked about your pre plan for Thanksgiving. By now you know exactly what you want for your Thanksgiving celebration, the food you want to serve, how you want your house to look (the flowers, the table setting), how many guests you’ll have, and you are feeling confident that you have it all planned out. We’re proud of you. This week is when you tighten up your list of all the things you need. Especially if (from your trial last week) you know what key ingredients you need for your special dish, or thought you had but didn’t, you know what works and what doesn’t and what needs to be changes. So now you have your final list and your opportunity to get most of what you need ready so that you’re not overwhelmed on cooking day. If you are a “make everything from scratch” kind of person then this is your week to prepare all the time consuming items that you absolutely must have. You can make you pie crust, vegetable soups, cranberry sauce and gravy over the weekend and freeze it. Actually anything you can make ahead and you know will be good by Thanksgiving, make it and freeze it or store it. Buy all your ingredients except for the items that will go bad or won’t taste as fresh if not consumed soon like your green or fruit salads. This week is also the best time for you to clean your house. Not that we are saying that you belong on an episode of Hoarders, but you are inviting guests to eat in your home. There is nothing as appetizing as eating in home where everything is disorganized or even dirty. Casts a shadow of doubt in the cleanliness of the food you are serving. So take your time to make sure the duts are off the shelves, the bathrooms are sparkling, and your kitchen is spotless. Make sure that pretty much all the rooms you know your guest will be in looks fresh and clean. This doesn’t mean that you have to redecorate and throw some fresh paint on your walls; just spruce up. Make sure to get some scented candles to burn on the morning of Thanksgiving so you can give your home that welcoming smell and mask some unsavory scents that come from cooking, we all know that some dishes taste fantastic but do not smell appetizing while cooking. Make sure that the centerpiece you ordered is coming from a reputable florist. You don’t want to get to the big day and have a gaping hole on your dining room table where there should be colorful flowers. 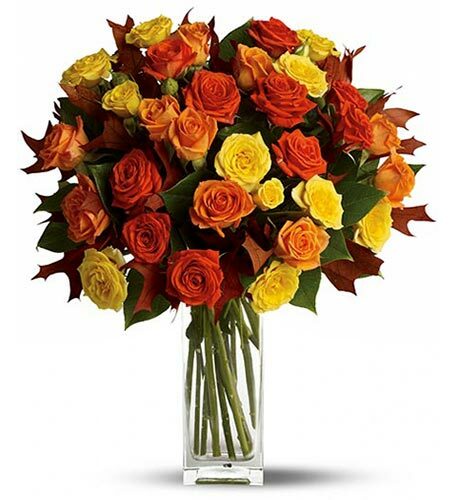 And if you’ve done your homework last week, and called a good flower shop (you know, like us) you will not have any doubts that you will have a gorgeous arrangement of fall flowers and colors to display and put an exclamation point on your whole table setting. Plus if you burn one of your dishes, you at least have beautiful flowers your guest can look at. Again, You’re Welcome! When we go out for the evening with our buddies, we “pregame”, right? Why should it be any different for the one day of the year we get to get “wasted” on yummy goodness? The same way we plan our outfits, hair and makeup for the ladies, Imbibe in our choice of “refreshments”, plan our transportation and decide weather we need a designated driver or we’re Ubering it, we believe that Thanksgiving deserves the same enthusiasm and excellent planning. This week we’ll focus on the not-so-fun but could be fun aspect of “Thanksgiving pregame”. The preparation. Make a list of everything you need from the guest list, to the decor, to the menu (therefore ingredients), to the anti-acids and the “cleanup crew” (the younger guests are perfect for this). Thanksgiving is the season open of the holiday season. So this is the time to dust off your cookbook and your dinner party planning skills. If you want to make a dish that you’ve never made before and you are experimenting and you know it will be complicated, we suggest you try it first now. Your family and your friends can taste tasters, giving you the opportunity to practice , know what works and what doesn’t, feed your family and friends and have the confidence that you will not end up with inedible lump of something or other that your guest will talk about till next Thanksgiving. Also, plan your drinks for both your adult and minor guests. This week, buy all the ingredients that can be stored and stay fresh till the big day like your spices, dry ingredients etc, so that you are not overwhelmed and can be sure you haven’t forgotten anything on the day of. If you start now then you know what you have and what you need to get and there is still time to go out and buy it without fighting the late shoppers later on, there is nothing worse than being in grocery store on a holiday. Plan your table setting. Take your time to inventory your plates, water and wine glasses, serving dishes, cutlery napkins etc. This is your opportunity to replace the wine decanter Uncle Bob broke last Thanksgiving while telling that funny joke (again). Call your florist and order your centerpice(s) for your dinner table, buffet table, powder room, kitchen, mantle, foyer, and coffee table. Remember a good flower arrangement can help you hide imperfections in your home. You have a glass ring stains on your wooden coffee table that that guest made by not using the coaster (Uncle Bob has destroyed your home, we get it), plop a beautiful arrangement on it. The fireplace mantle paint has chipped? Place a long and low centerpiece on it. Powder room is going to get a lot of action so place a fragrant arrangement by your sink (again, Uncle Bob). Plan on some entertainment for the young guests and for those that don’t have the desire to unbutton their pants and luxuriate with a happy tummy in front of the tv watching some pigskin action. Now you know if that croquembouche recipe you wanted to try will work, you already know what you need to buy (food or otherwise) and how your table will look. You know where to sit Uncle Bob (away from the flammables, breakables and down wind), and you already feel the weight of the holiday stress falling from your shoulders. You can now strut your stuff knowing you’ve got it this year. You’re welcome.